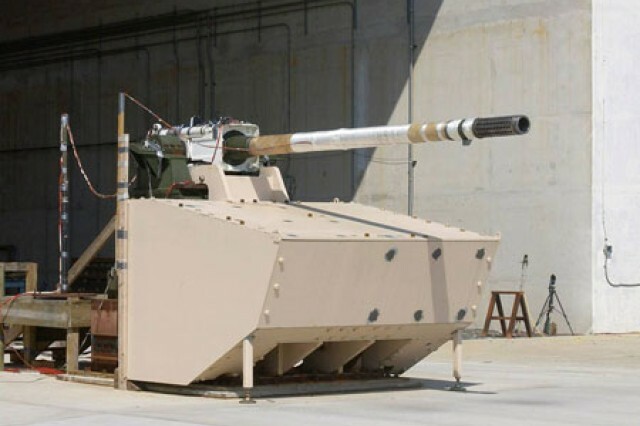 Below The Turret Ring: Upgraded Abrams to feautre XM360 gun and guided ammunition? Upgraded Abrams to feautre XM360 gun and guided ammunition? "Next-Generation Large Caliber Cannon Technology. The XM360 next-generation 120mm tank cannon integrated with the AAHS will provide the M1 Abrams a capability to fire the next generation of high-energy and smart-tank ammunition at beyond line-of-sight (LOS) ranges. The XM360 could also incorporate remote control operation technologies to allow its integration on autonomous vehicles and vehicles with reduced crew size. For lighter weight vehicles, recoil limitations are overcome by incorporating the larger caliber rarefaction wave gun technology while providing guided, stabilized LOS, course-corrected LOS, and beyond LOS accuracy"
The 120 mm XM360 tank gun was originally designed for the XM1202 Mounted Combat System tank component of the canceled Future Combat Systems (FCS) program of the US Army. It retains the original dimensions of the M256 smoothbore gun (aside from being fitted with a muzzle break to reduce the recoil impulse/force) and is ballistically equivalent to the M256 gun when firing the same ammunition. Due to having an increased pressure limit the XM360 gun can however utilize more powerful KE ammunition. An ammunition data link (ADL) allows the usage of programmable ammunition or more accurate firing (i.e. when the propellant temperature can be taken into consideration by the fire control system). Parts of the barrel and many other components are made of composite materials, which reduces the weight compared to a conventional design. The XM360 is 2100 pounds (952.5 kilograms) lighter than a M256. The XM360E1 is a version of the XM360 specifically designed for the M1 Abrams. Some components of the former M256 gun like the rotor are reused to reduce cost and increase commonality to older M1A2 tanks. It seems very likely that the XM360E1 is actually meant, when the article from TRADOC speaks about the XM360 gun for the M1 Abrams. From the renderings of the XM360 and XM360E1 posted above, the XM360E1 appears to have a slightly longer barrel. However this is no secured information and no official data on the XM360E1 has been published yet. The fact that the XM360E1 looks longer might be result of the perspective or the claims that the XM360 has the same length as M256's are including the muzzle break in the XM360's length, albeit drawings implying otherwise. The XM360E1 might have a barrel length of 46 to 48 calibre then. The second part of the quote is implying that the US Army has yet to loose interest in developing guided tank ammunition. 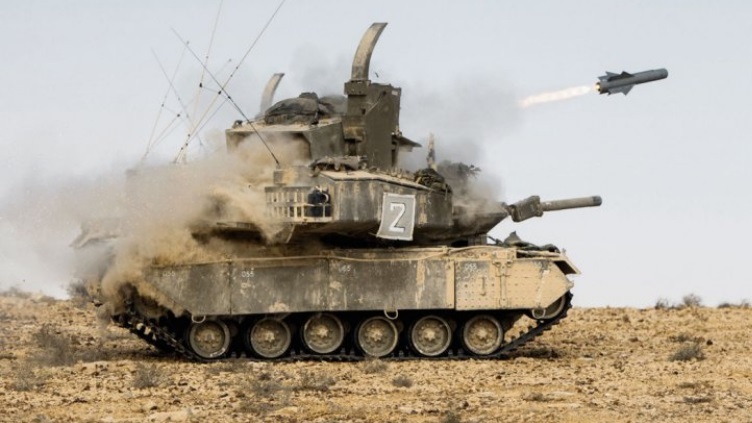 This means that the Army has either reactivated a formerly canceled development program like the XM943 STAFF or the XM1111 Mid Range Munition (MRM), or the US Army has started a new development program for long range/beyond-LOS guided tank ammunition. While upgunning the M1 Abrams is certainly a move in the right direction - the Leclerc with it's GIAT CN-120-26 and the Leopard 2A6 with it's Rh 120 L/55 tank gun have already introduced longer barreled tank guns designed to sustain higher operating pressures more than a decade ago - the question remains if the XM360 is enough for the future. The German company Rheinmetall is currently working on an improved 120 mm smoothbore and a new 130 mm smoothbore gun for the Leopard 2 and the future Franco-German main battle tank (MBT), while the new Russian T-14 MBT is being fitted with either a new 125 mm high-performance gun (2A82) or an 152 mm 2A83 gun. It seems that the US tanks might be lacking in the gun department, despite receiving a new gun in the near future. The fact that the XM360E1 gun's barrel is rather short might be related to the oscillation and stabilization issues found on the M1A2, when investigation upgrading the M1A2 tank with the Rheinmetall L/55 (M256E1) gun. From 1998 to 2000 the US tested three modified Rheinmetall L/55 guns (and a further 12 barrels produced under licence by TACOM/Watervliet Arsenal) under the designation M256E1. While the Rheinmetall gun was designed to specifically fit into a modified gun mount of the German Leopard 2 tank, the different gun mount and stabilization systems of the M1A2 Abrams had troubles handling the longer and heavier barrel. This would result in a reduced accuracy and required major modifications (including a completely new stabilization system) to fix, which results in inappropriately higher costs for simply upgunning. The same issues arrived when testing the 120 mm XM294 L55 smoothbore gun prototype on the Abrams between 1996 and 1998. As far as the guided ammunition is concerned, one should take into account that this has to fit into the XM360 smoothbore gun and into the ammo racks of an M1A2 tank. This means the maximum missile diameter can be 120 milimetres (mm) and the maximum length of a hypothetical gun-launched missile for the Abrams can not exceed ~990 mm (39 inches). Unfortunately the limitations on the missiles size have a negative impact on the possible effectivness: currently all ATGMs are relying on shaped charge (HEAT) or explosively formed penetrator (EFP) warheads. Modern ATGMs such as the Hellfire, Javelin, PARS 3 LR (TRIGAT), Spike-LR, Kornet, etc. all exceed a diameter of 120 mm, mostly by a rather large amount. The length of long-range high performance ATGMs exceeds 1.5 metres (59 inches). Thus it seems rather unlikely that guided LOS/BLOS ammunition for the M1 Abrams can defeat the frontal armor (in some cases even the side armor) of a current and next-generation tank. Therefore in order to have a high chance at defeating current generation armor, the guided ATGMs have to follow a top-attack design. Even then, a number of current tanks already has enhanced roof protection against top-attack ammunitions (e.g. every Soviet/Russian tank since the 1980s has roof mounted explosive reactive armor). Some variants of the German Leopard 2 aswell as the Israeli Merkava tanks have been fitted with passive roof armor against shaped charges and/or EFPs. So overall there are good news for the Abrams, but are they good enough?